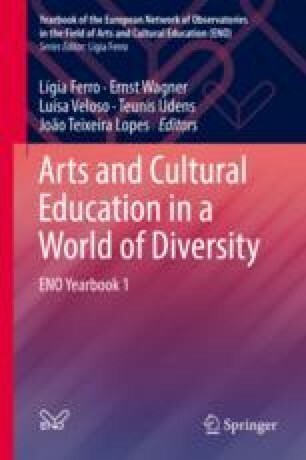 The study explores the potential of arts education to contribute to the development of intercultural competencies and the challenges and possibilities for harnessing its potential. It does so based on an analysis of the impacts of a 2-year-long arts education project implemented in schools characterized by high levels of cultural diversity in Catalonia, Spain, and a focus group discussion with the participating teachers and artists. The results suggest that arts education can contribute to enhancing cultural awareness and knowledge, improving relations among classmates, raising awareness of cultural expression as a human right and enhancing perceptions of schools as places for expression of one’s own culture. However, impacts are not automatic and arguably differ by discipline. More targeted evaluation frameworks that capture a broader range of intercultural competencies would contribute to generating better understanding on the topic. At the same time, increased opportunities for specialized training for both artists and educators could contribute to better harness the potential of arts education to contribute to the development of intercultural capacities among students from diverse cultural backgrounds. Alesina, Alberto F., William Easterly, Arnaud Devleeschauwer, Sergio Kurlat, and Romain T. Wacziarg. 2002. Fractionalization. Harvard Institute research working paper no. 1959. Available at SSRN: https://ssrn.com/abstract=319762 or https://doi.org/10.2139/ssrn.319762. Díaz, S., and S. Montemayor (coord.). 2007. La educación artística como instrumento de integración intercultural y social. Madrid: Ministerio de Educación Cultura y Deporte/Secretaría General Técnica. Available on-line: https://dialnet.unirioja.es/servlet/libro?codigo=294776. Ortiz, M.A., and A. Ocaña (coord.). 2006. Cultura, culturas. Estudios sobre música y educación intercultural. Atarfe: Grupo Editorial Universitario. Available on-line: https://dialnet.unirioja.es/servlet/libro?codigo=455497. ———. 2013. Intercultural Competencies. Conceptual and Operational Framework. Paris: France. Available on-line http://unesdoc.unesco.org/images/0021/002197/219768e.pdf. United Cities and Local Governments (UCLG). 2004. Agenda 21 for Culture. Barcelona: UCLG. Available on-line: http://www.agenda21culture.net/sites/default/files/files/documents/multi/ag21_en.pdf. United Nations. 1948. Universal Declaration of Human Rights. Paris. Available on-line: http://www.un.org/en/universal-declaration-human-rights/index.html.